ATTIKA7 is throwing a huge party full of metal, motorcycles and television stars, and you are invited! ATTIKA7 is thrilled to announce not only a metal show, motorcade, or meet and greet, but the whole enchilada – taking place on January 29th at The Whisky A Go Go! The event begins with a full bike run/motorcade at Illusion Cycles, the motorcycle shop of ATTIKA7 guitarist and Sons Of Anarchy star Rusty Coones, at 6:00pm (14726 Goldenwest St. Suite F, Westminster, CA 92683). The bike run is taking place to raise awareness and donations for the American Soldier Network. 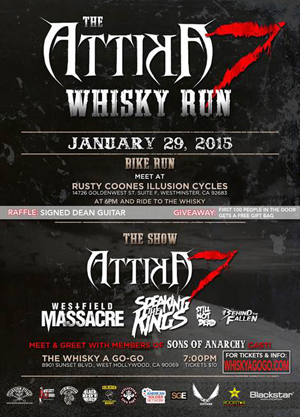 The bike run will ride to The Whisky A Go Go for an ATTIKA7 show, beginning at 7:00pm ($10 tix!) featuring special guests WESTFIELD MASSACRE, SPEAKING THE KINGS, STILL NOT DEAD and BEHIND THE FALLEN. Make sure to visit the bar during the show for COLDCOCK Whiskey specials all night! The event will not only featuring a raffle for a signed Dean Guitar (to be presented to the winner post-show), but the first 100 people at the door will get a FREE gift bag with COLDCOCK, Rockstar, and Affliction swag! And last but definitely not least, the event will feature a post-show Sons Of Anarchy and ATTIKA7 meet & greet and signing, featuring the whole band (Evan Seinfeld, Rusty Coones, Ira Black and Tommy Holt) and select Sons Of Anarchy cast members. More celebrities and stars are planning to show – so this is a CAN’T MISS EVENT! For more information and tickets, visit www.whiskyagogo.com or www.ticketweb.com. ATTIKA7 is currently writing their new album and it promises to be their most experimental and hard-hitting release yet! Stay tuned for more news coming from the ATTIKA7 camp, coming soon! For more information, please visit www.attika7.com and www.facebook.com/attika7.